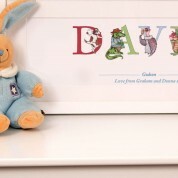 A personalised name frame makes a lovely keepsake gift for your godson for their christening, birthday or Christmas. Each character has been originally drawn and painted in house by our illustrator with a little story to show their personality like 'Adventurous Alligator' or 'Jammy Jaguar'. Phonetic letter gifts are fun for children to use to learn the alphabet and how to spell their name. 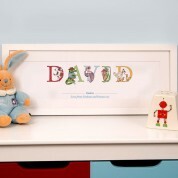 The design team will lay each child's name out carefully to create a balanced design within the frame – this means that if there are two or more on the same wall they will sit comfortably together regardless of name size. The child's name is printed on high quality watercolour paper using a wide format printer and then professionally sealed and framed in house. 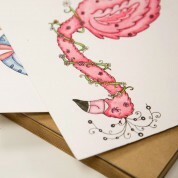 The mounts and frames are custom made especially for the name frame so fit together perfectly. Once hung up this white silk paint finish frame with a white mount will brighten up any boy's bedroom. The wall fixings and a gift tag are included.